Notice the title of this post refers to “hindering,” not “hurting.” I hesitate to refer to any kind of help a person offers as hurtful because the intentions are good. But it’s so often hard to know what to do to help someone with OCD. After my book reading earlier this month, we opened the floor to questions. One woman, a mother of two young boys, asked how a person can support a friend or child with OCD. I told her supporting someone with OCD can feel like the opposite of supporting a friend–being too reassuring can enable a person with OCD, making it easier for the person to continue performing the compulsions that offer temporary relief and ultimately hold them back from living a full, rich life. I shared the example of Howie Mandel’s wife washing his money for him. A spouse helping out with laundry or the dishes or making the bed isn’t a bad thing. But she’s doing him no favors by going along with his fear of touching money that other people have handled. Mandel can get by with this, I think, because he’s a celebrity. He probably has people who can handle money for him. He’s not facing his fears. And defeating OCD is all about facing the things we fear most. Well, there you go. Losing his wife and daughter would be the absolute worst thing to happen to him, and that is why he worries he’s gay. How could he stay married to his wife if he’s gay? And then if they get divorced, when will he see his daughter? As much as I know–as much as I can know–that he’s not gay, that OCD is playing tricks on his mind, I’m not doing him any favors by constantly reassuring him. On the other hand, I’m a layperson, just another poor soul who’s been afflicted with terrible obsessions. Is it really responsible of me to try to lead some sort of halfway ERP over Facebook? Of course not. 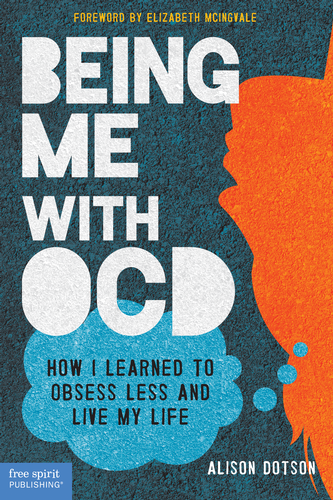 All I can do is listen, tell him I’ve been there, tell him what has helped me–to remind myself that obsessions are there because OCD is a beast, not because I’m a bad person. To remind myself that everyone has bad thoughts, but people with OCD can’t let those thoughts go. To calmly tell myself that it’s just a thought, and it holds no meaning I don’t give it. It’s hard to tell someone I can’t keep reassuring him because the relief he feels is just as fleeting as the relief a compulsion provides. How do you offer support to friends with OCD? If you have OCD yourself, do you tell the person everything that helped you? Do you just listen? Do you offer book recommendations? Let me know! I want to be the best source of support possible, and it’s such a gray area that I will take any advice I can get. Having OCD isn’t exactly a treat. But since I was diagnosed several years ago, I’ve been consistently impressed with the OCD community. Whether it’s another person with OCD, a psychiatrist who specializes in OCD, an author, or OCD support groups, I’ve found one thing in common: an unwavering willingness to help. I’ve known this for a while, but it was solidified when I started to write my book. Every time I reached out to someone, whether it was for permission to re-create a chart they’d published, for help finding young people who would contribute essays to my book, for a review, or even to write the foreword to my book (Elizabeth McIngvale! ), I was met with enthusiasm and thoughtful responses. When I included a note in a small donation I made to the International OCD Foundation (the most I could manage at the time), the foundation wrote back. In a handwritten note. I was surprised, and grateful, and touched. This was no ordinary nonprofit, that was clear. Over time I’ve become more and more ingrained in the OCD community myself (of course I’ve been a member since I was diagnosed). Although it can be difficult at times, especially when I chat with someone who can’t yet see the light at the end of the tunnel, I love being purposeful about my role. I can give back and be selfless about my commitment—something I’ve learned firsthand from my predecessors and peers.